I would give Souls of the Never by C. J. Rutherford a 6 out of 10. 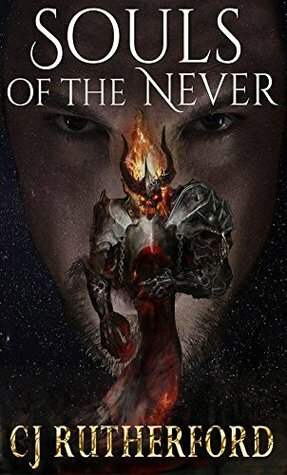 Souls of the Never is the first book in the Neverwar series, and it combines elements of science fiction, fantasy, and young adult romance to create a unique story. It is a little bit of Fringe combined with Twilight and adding just a hint of urban-fantasy mixed together. Katheryne is plagued by strange dreams where she must protect herself and others who are tormented around the universe from a formidable beast who is set to ravage the world. She does this by collecting them all on an island in her mind where they can find sanctuary. Help comes to her from a dashing alien, Derren, who she can never tell if he is real or not because it only takes place in her dreams. All of this comes to a head when she sees the same person from her dreams in a bar in Belfast one evening and she discovers that what she has been participating in is actually part of a greater chess match and she is one of the key players. C. J. Rutherford explores some great ideas in this story. There is the ever present battle of fate versus freewill and whether we have control over our actions or are just a part of some greater plan. Multiple universes also play a part in this story and how our lives might be different by making a simple choice over another one. Rutherford also explores the concept of time, and how our choices might change the course of history. These are all interesting ideas, but they have been explored by other writers, and Rutherford doesn’t bring anything new to the table. The concepts do play out nicely together in the story that he has written. He combines a lot of action with the obvious romance that is quickly developed between the “star-crossed” lovers. It creates an entertaining story that would play out nicely on a summer movie screen and probably would enjoy moderate success if it ever finds itself there. The problem comes with the editing of the novel. Within the first couple of chapters there are many glaring grammatical errors that distract the reader. He couples this with a series of stock characters: the helpless heroine who finds strength in herself, her sassy best friend who is her rock in a sea of troubles, the dreamy yet mysterious love of her life, and the faceless enemy who torments them all. This makes me wonder if this wasn’t written by a younger man. There are also problems with time in the text of the story where the reader starts to wonder if only a day has passed or a whole week. The book just screams that an editor could have helped C. J. Rutherford come up with a more quality product. With this still in mind, the story itself is very good, and there is a lot of potential there. Like I said earlier, it is very entertaining, and the concepts that Rutherford plays around with are very cool. It makes me wonder where this writer will end up in ten years after he has developed his craft a little further.